As you've found this website, I'm guessing you are looking to change something about your life. Please have a look around our website and see if we can help you achieve these changes. This Service is run by Joanne Lindsay who has run her own counselling and Hypnotherapy service since 2011. Joanne has always offered a low cost service and discounts where possible, but as demand became higher and her own service became busier, she decided to start this cost price service up so that more people could benefit from it. The counselling is provided by a team of volunteer / student counsellors, who are all members of the BACP and have been or are being trained by a recognised counselling training scheme. What does Bellis Daisy mean? Originally Joanne chose the name Daisy as it was the name of one of her grandmothers. Daisy was a formidable women surviving many a trauma and stressful life event with courage and strength, which Joanne has always found as inspirational and a testament to how we as humans have such inner capabilities. Purity - we're all born pure with no influence and Carl Rogers who founded Person Centered Therapy described this as the 'Organismic self' with the right core conditions of Empathy (being able to step into someone elses shoes and see it from their perspective), Unconditional Positive Regard (non judgmental and accepting) and Congruence (being real, open and honest) then a person is able to strive, flourish and process through challenges - 'Self-actualizing tendency'. Innocence - we're all learning to live life as we go along. Decisions - 'he loves me, he loves me not' the daisy has helped people make decisions for centuries, by simply taking the time to ponder over each petal. Resilience - it gets mowed down, but soon grows back like weeds. Protection - also known as the 'Thunder flower' as apparently a field will not be struck by lightening if there are Daisies. Support - daisy chains - put together they create a solid structure. Soothing - when it's crushed it helps bruises or chapped skins (bruisewort) and when it's brewed into a tea it helps sore throats and stomach aches. Patience - it takes time to change and work on yourself, but change is possible. So Bellis, as above translated means 'Pretty'. 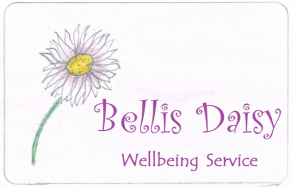 but as Joanne researched finding a name for this service she realised that within the word 'Bellis' spells Bill, which is the maiden name for her other formidable grandmother Muriel, who died just short of her 100th birthday in December 2016 whilst Joanne was setting up this project, having survived wartime Liverpool and like Daisy many difficult life challenges.